Now I know I'm not the only one, but my skin tends to get incredibly dry and flaky throughout the winter months. When the temperature drops, I make sure I keep a few body butters handy. There have been a few I keep handy the past few winters, so I thought I would share a few of my favourites. 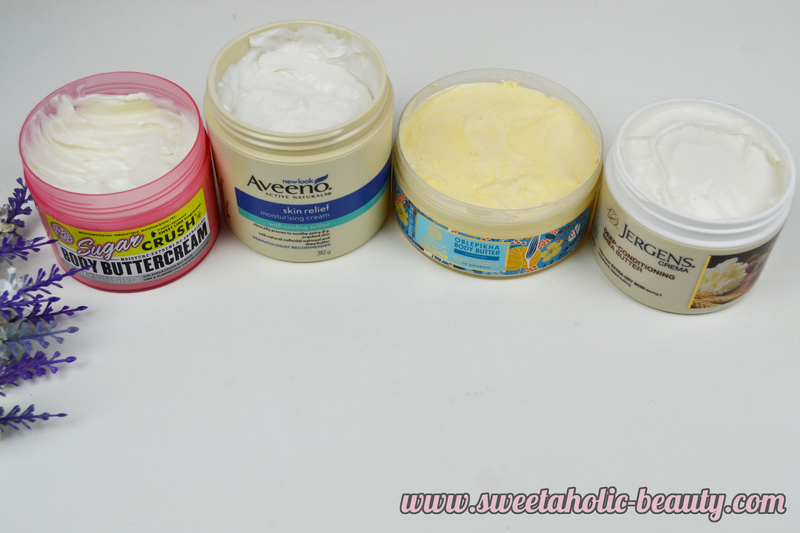 I've been using four gorgeous body butters this winter so far. All four are fairly different, and I usually opt for them for different reasons. I have a yummy smelling on, an extremely moisturising one, one for sensitive skin, and a quick absorbing one for when I'm on the go. 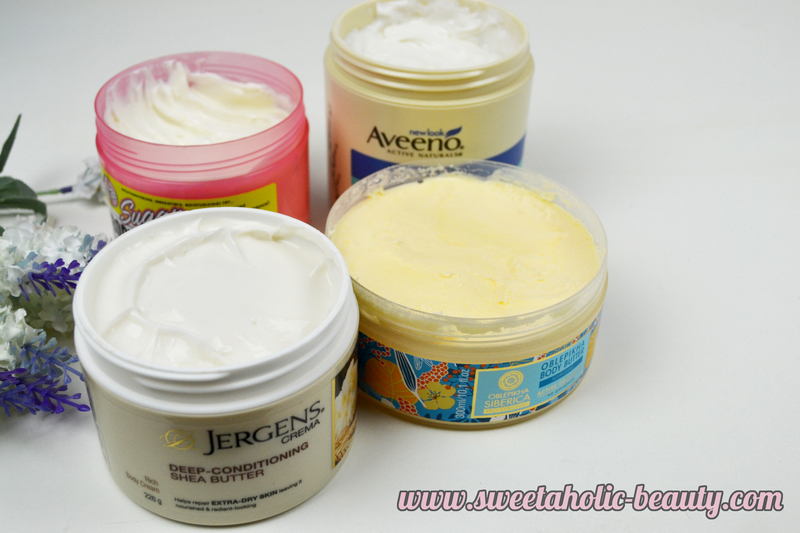 The first body butter I would usually opt for is the Jergens Deep-Conditioning Shea Butter* as it's heavily moisturising and just perfect for my dry skin. It smells amazing, and because it contains shea butter, my skin always feels so soft and smooth. This one usually takes a while to actually absorb though, so I usually will like to use this after a warm bath in the evening before bed. When I'm looking for something quick absorbing, I'll usually grab my Natura Siberica Oblepikha Body Butter*. I feel like this is less of a butter and more of a solid type moisturiser, as I have to put pressure to grab lots of product. It's a bit more of an oily product, but absorbs super quickly while still retaining the moisture in my skin. Sometimes I get sensitive skin throughout the winter time, and I'll get itchy and end up scratching and making things worse. When I'm feeling itchy I'll always pop on some Aveeno Skin Relief Moisturising Cream; this one has cooling action so if I've already scratched a little bit, it's very calming. This tub is huge and a little really goes a long way. Lastly, if I'm heading out but feeling flaky, I'll use the Soap & Glory Sugar Crush Body Buttercream as it smells like heaven. I find this one far too scented to use before bed or when I'm trying to relax, but it's nice to use if I'm heading out as it doesn't smell like your regular hand cream or body cream. 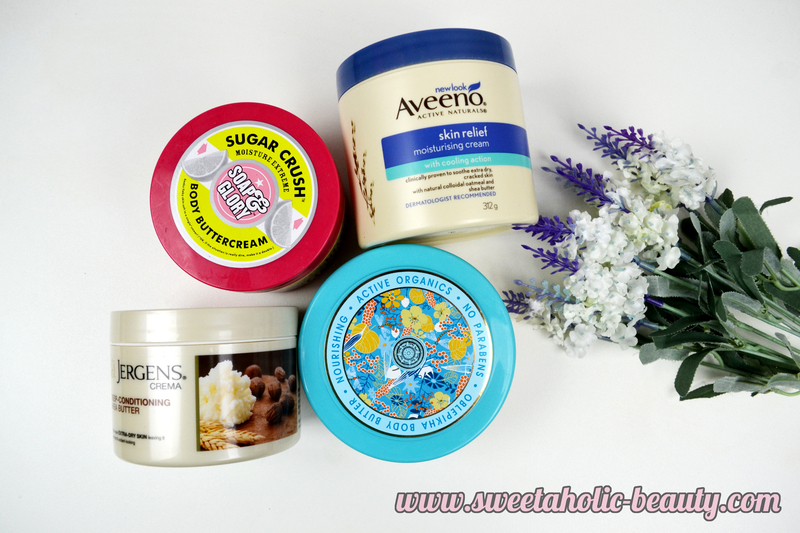 These four body butters are always at hand during winter for me. I don't think I could pick a favourite, as they're all fantastic for different reasons. All of these body butters are fairly cost effective too, and are all available in Australia for purchase. The most expensive one would probably be the Soap & Glory Body Buttercream. Have you tried any of the above body butters? If so, what are your thoughts? 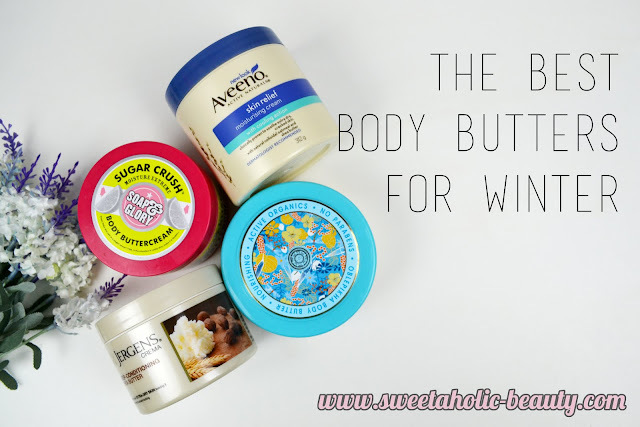 What's your favourite body butter to use throughout winter?